In an increasingly connected world, CAF America is committed to enabling diasporas across the world to donate to their home communities in a safe, easy, and effective manner. We recognize that all diasporas are unique and within each are hundreds and thousands of unique individuals with their own goals and passions. That is why we are looking to take a flexible approach with the Diaspora Gives Program, which encompasses various philanthropic giving models tailored to fit the needs of various diaspora groups. Diasporas often give back through informal channels, foregoing a tax-deduction and risking their money falling into the wrong hands. Through donor advised giving, CAF America is able to not only provide diasporans with a tax-deduction, but can ensure that their donations are compliant with relevant regulations, that any risks they have been mitigated, and that their reputation is protected. If you are a diaspora member and are interested in learning more about our Diaspora Gives Program, please contact us at diaspora@cafamerica.org or call our offices at 202-793-223. 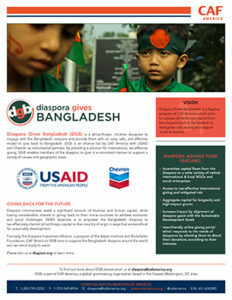 Diaspora Gives Bangladesh (DGB) is the cornerstone initiative of CAF America’s Diaspora Program. DGB aims to catalyze philanthropic capital from the Bangladeshi diaspora in the U.S. and Canada to strengthen civil society and social enterprise in Bangladesh. For more information about DGB, please visit diagives.org. Download the DGB Onepager here. The Diaspora Philanthropy Summit took place on November 2-3, 2017 in Washington D.C. bringing together diaspora groups from the U.S. and Canada committed to contributing to the development of their home communities through charitable giving. Delegates shared their plans to engage and/or inspire fellow diasporans while learning from CAF America’s, CAF Canada’s, and other delegates’ various models and programs for focusing tax-effective support towards validated charities and projects in their established or ancestral homeland. For more information on the Diaspora Philanthropy Summit, email diaspora@cafamerica.org.